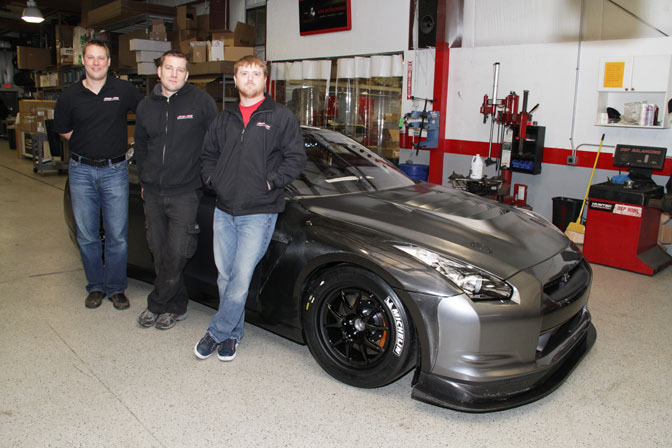 The AMS World Challenge GT-R build began with a brand new R35 GT-R delivered direct from the dealer. The odometer reading showing a grand total of 74 miles. 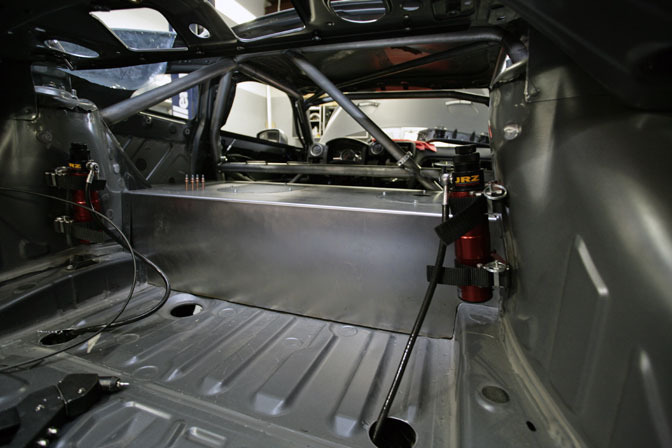 Since weight reduction is an important factor to performance in the World Challenge GT Series, the vehicle was thrown on the scales to measure stock weight with all fluids and an empty fuel tank… 3908lbs. No time was wasted. 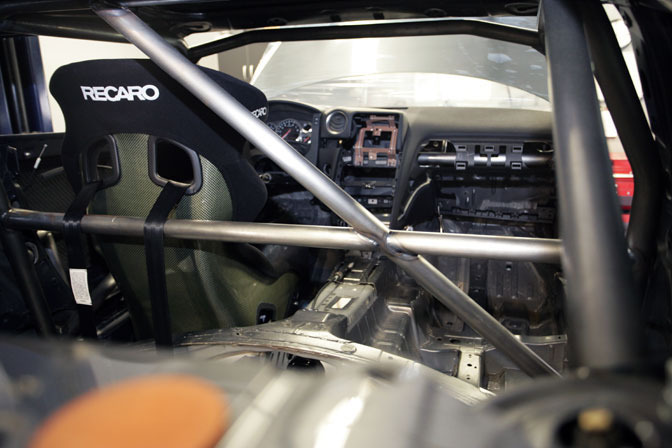 The interior was thoroughly stripped in order to begin the cage and chassis fabrication process. 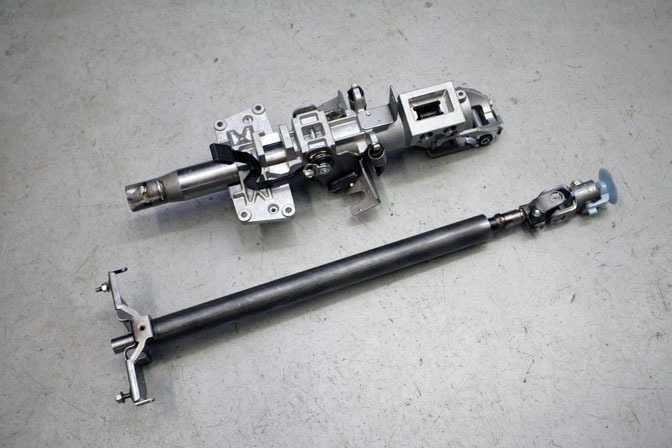 The entire driveline was removed in order to build the transmission for the abuse it would receive throughout competition. 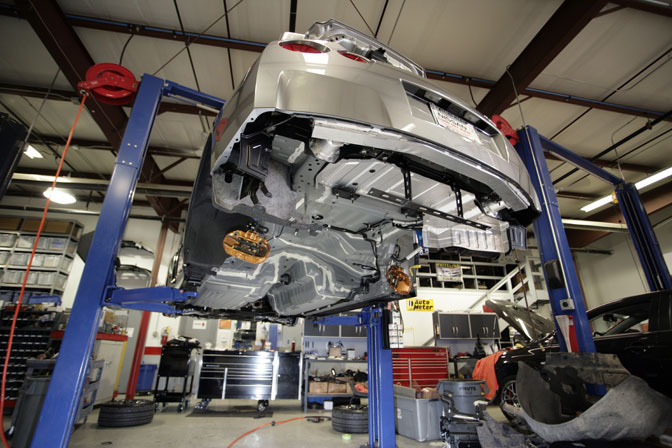 Every component was stripped to analyze for ways to improve them. From aero, to weight all the way to cooling. Every corner was touched. 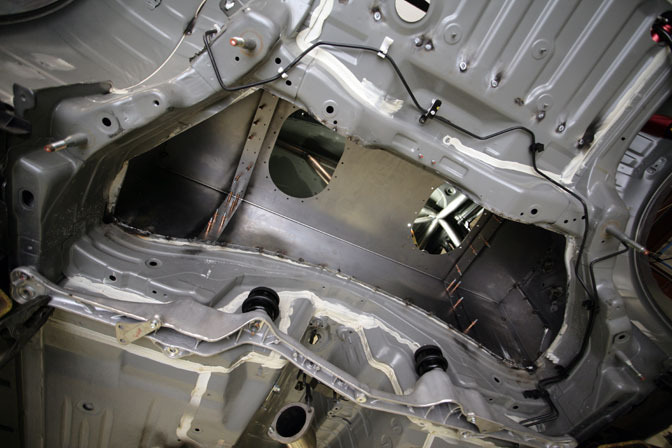 Sections of sheet metal were removed for weight reduction and to make room for control systems. Justin Wylde, head of the World Challenge construction project hard at work prepping for the cage and new fuel cell. A template was made of the new fuel cell to optimize space and weight distribution. World challenge races are long so the factory cell simply did not have the capacity needed. 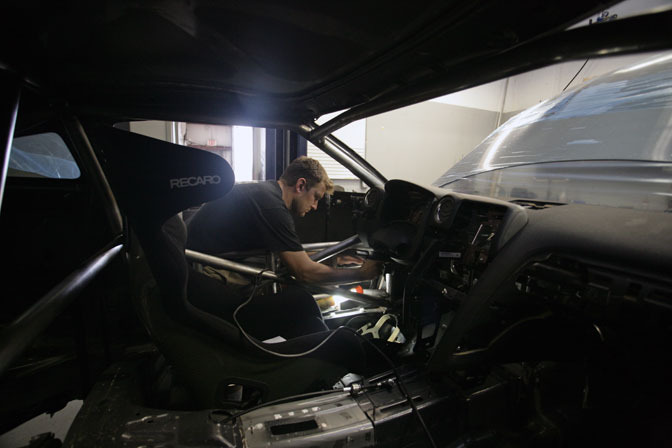 Recaro Hans supported seat about to be test-fitted in its new home. A new steering column was made to shed some more weight off the car. 7lbs in total was saved just from this particular component. The cage is starting to come together. 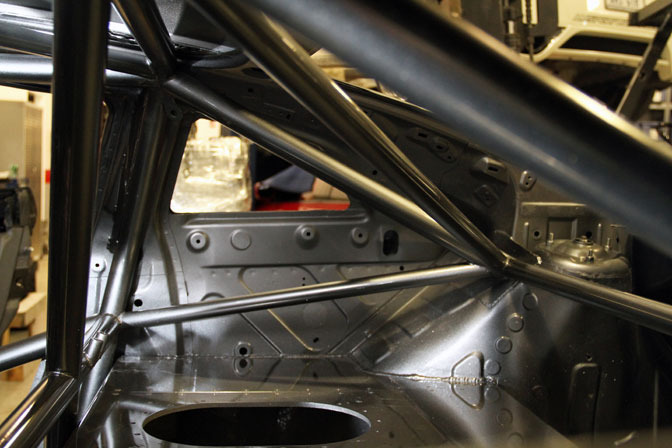 Safety and chassis enhancement need to work hand in hand with a proper cage. 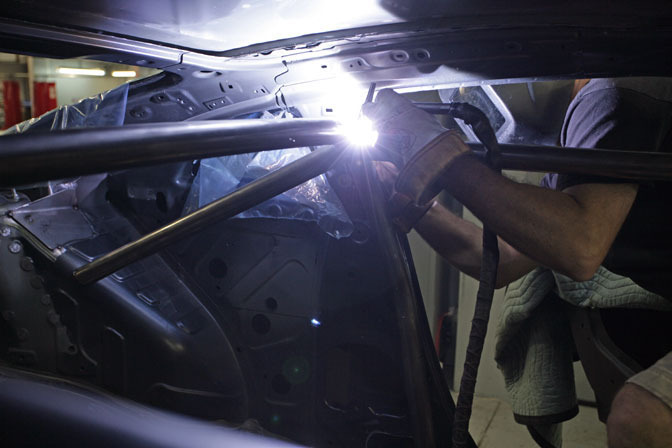 Justin making more progress on the cage assembly / fabrication. 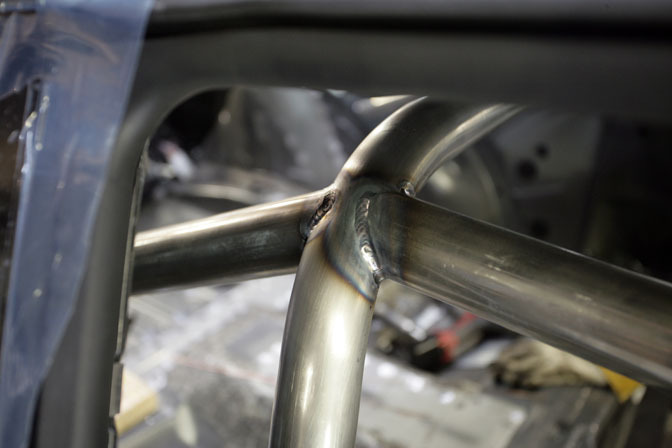 Clean, strong and perfect welds as always at AMS. The cage was dropped for easier access. Justin welding in one of MANY tight spots during this build. Eric Jones (foreground) and Danny Machowiak (background) removing the stock engine to begin work on the power areas of the build. When Eric Jones strips an engine bay he doesn't leave anything left! 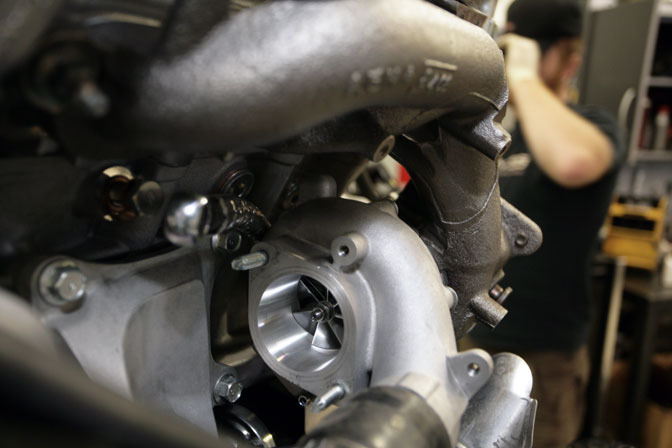 AMS Alpha 9 turbo's installed on the new World challenge Engine. The series calls for boost limitations but even so these should add a good increase in HP. After all upgraded engine components have been added, the motor is now installed back into the car along with some cooling enhancements. Wheel to wheel racing adds a dynamic to cage building not seen in other series. 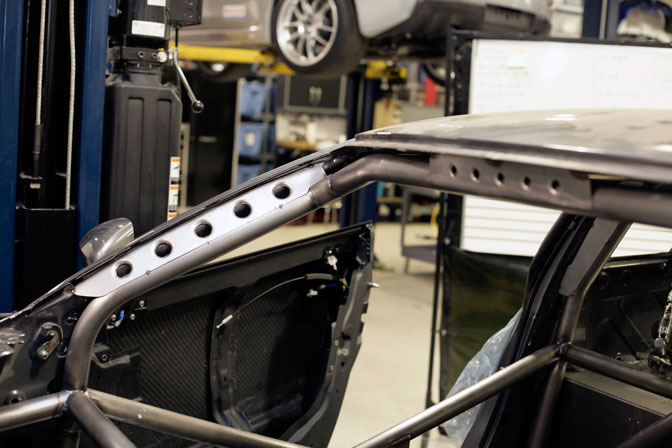 Side impact protection has to be thoroughly addressed. Well thought out and fabricated driver door bars courtesy of Justin. 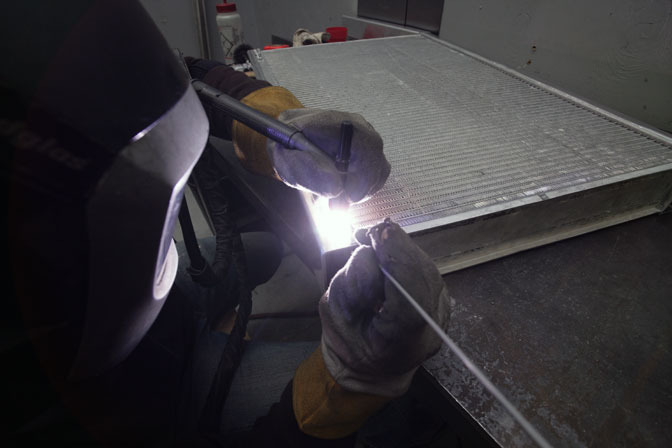 Justin welding up side support plates for the cage. The interior is starting to come together. The new fuel cell is test fitted in the car. The factory saddle style cell was a great piece and in order to maintain improved volume and weight distribution that same design was adopted into the design of our new cell. 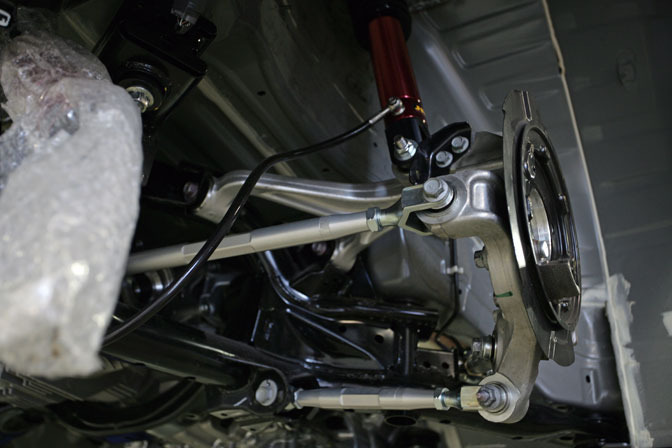 Improved suspension components are a must in this project. 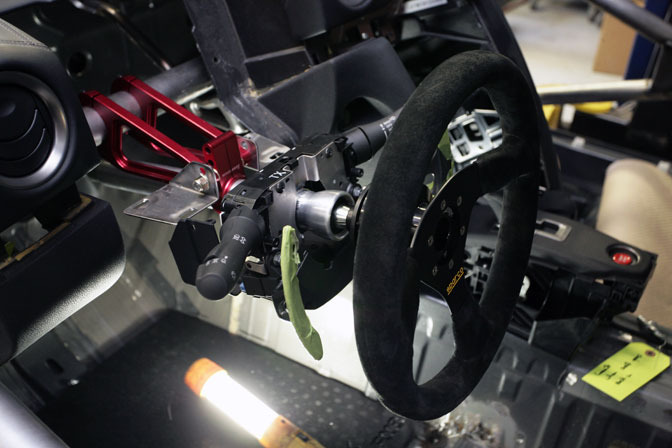 Adjustable control arms were added in lieu of the factory stationary units. New suspension components installed along with the fuel cell taking more shape. 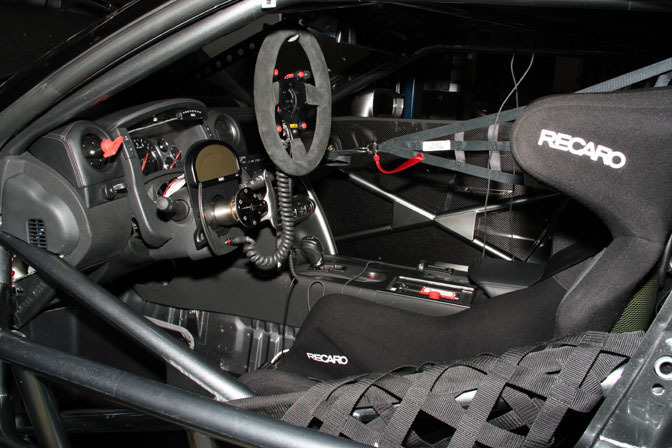 Custom fabricated Seat brackets by AMS for the Recaro carbon kevlar seat. The new steering column and wheel installed complete with collapsable column for safety enhancement. 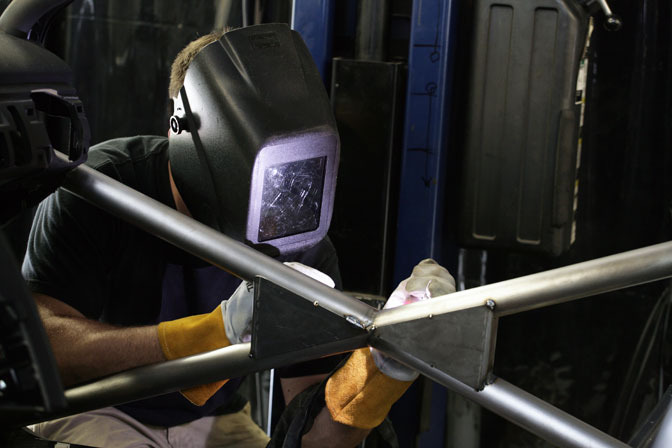 Here we see the beginnings of rear wing fabrication. 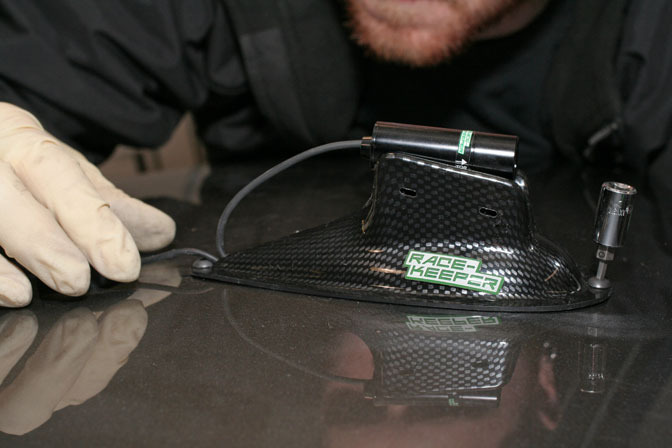 The new carbon fiber trunk lid is installed so that wing mount fabrication can begin. 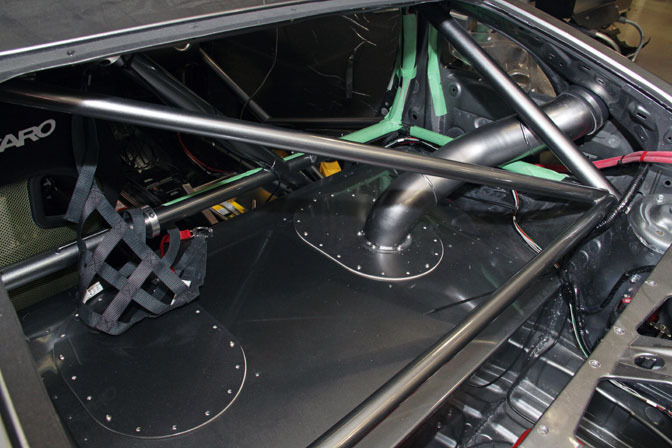 Custom wing uprights are made to mount not only to the carbon fiber trunk but the body as well. 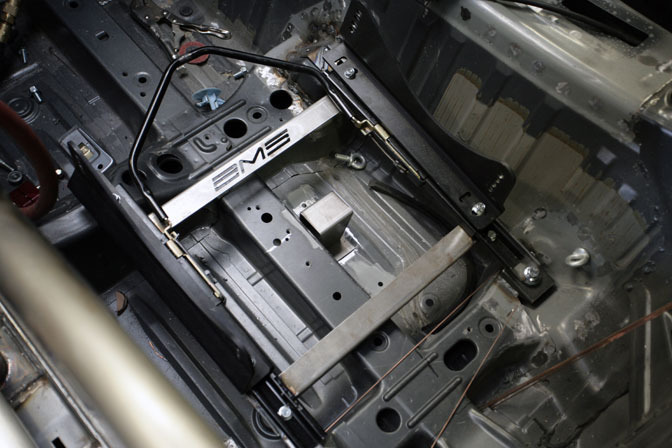 This helps maintain rigidity and optimizes the effect of the wing at speed. 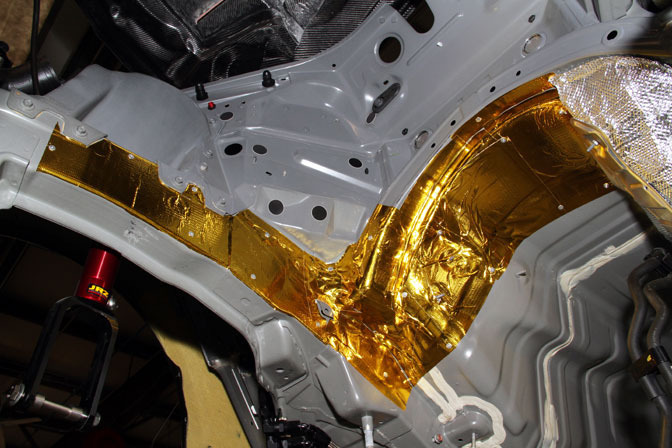 A very complete and well thought out fuel cell cover is made for the world challenge GT-R. This is necessary to prevent fuel from spilling into the cockpit in the event of a fuel cell rupture. 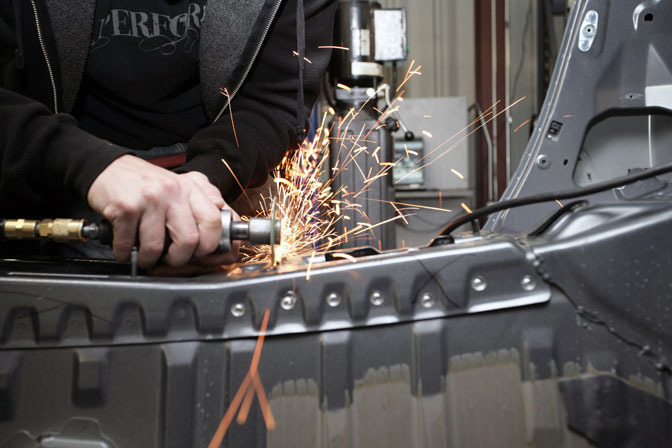 This new fuel cell cover acts as a firewall for the drive. 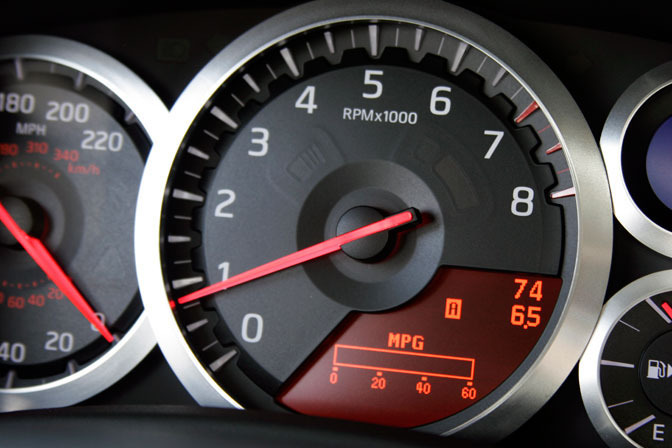 Everything in the GT-R is tight. Our WC project is no different. 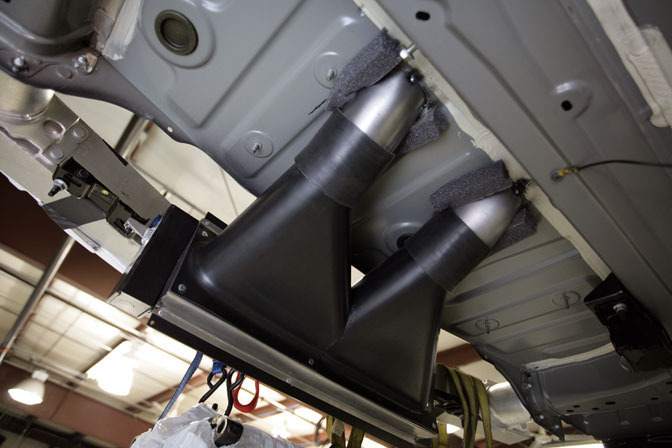 even the fuel cell had to be fabricated to allow for space constraints due to the custom exhaust. 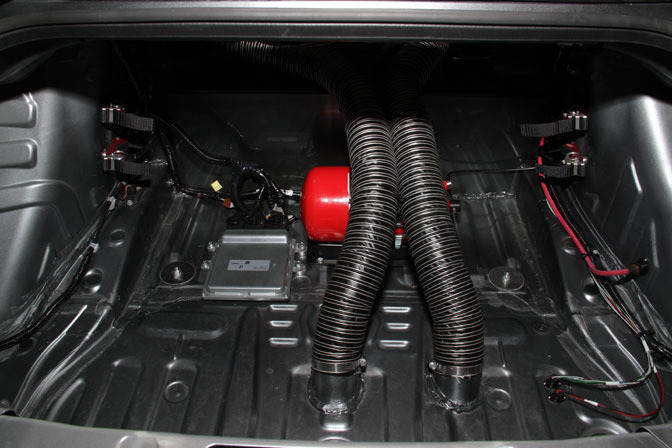 A custom transmission cooler was made allowing for clean air to be routed to a secondary cooling system. 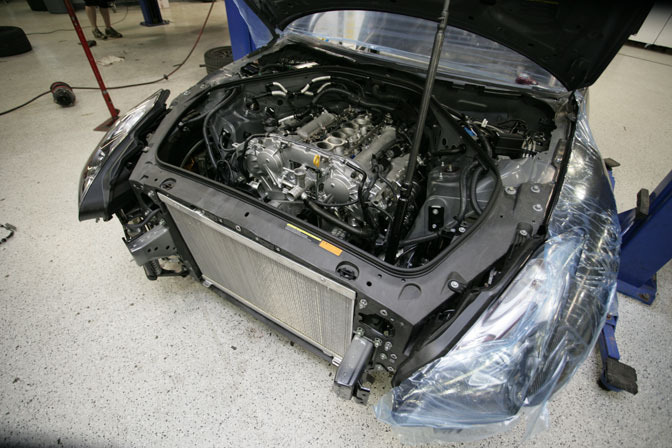 Engine cooling is a critical part to with the GT-R. For this reason a custom large volume radiator was made for this project right here at AMS. 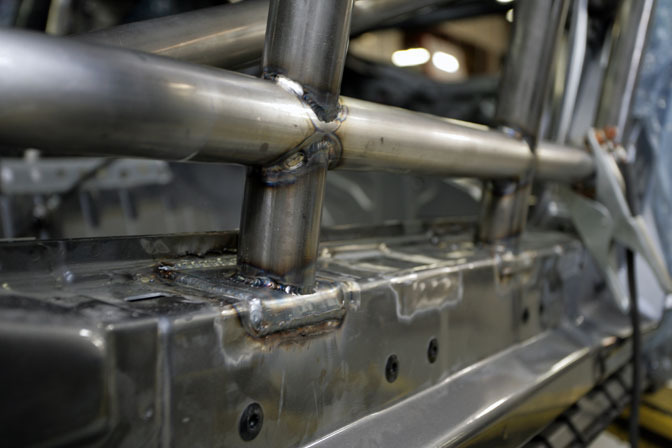 Gussetting of the cage ties the chassis and cage together to provide our customer an extremely stable platform. 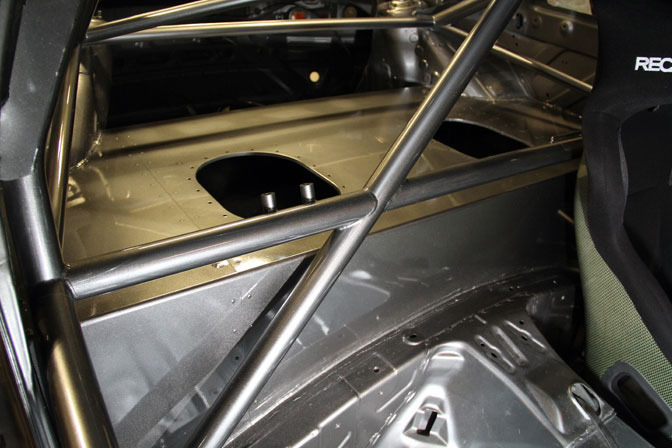 With the cage and fuel cell work complete the interior of the car is painted to match the exterior. The cage and fuel cell came out incredible. The final product is some of our best work yet. More fortification with roof gusseting being added. Setting up the placement for the new fuel door. 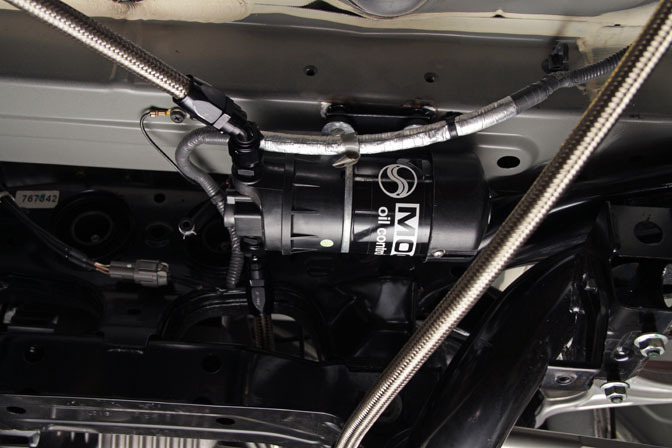 The Mocal fluid pump is added to the new AMS trans cooling system. 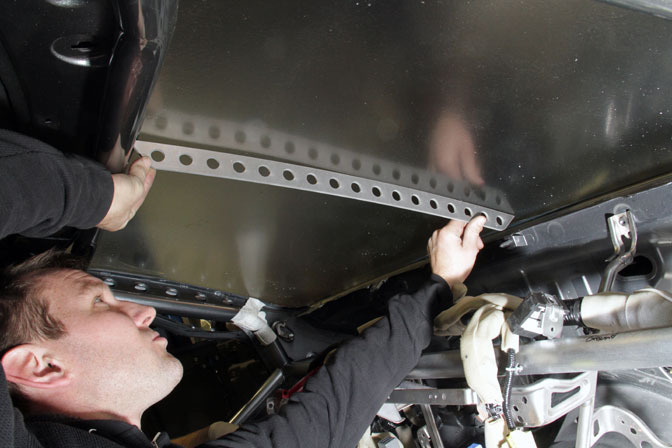 Thermal tape is added to the underbody of the car to keep cabin temps down and the driver cool. 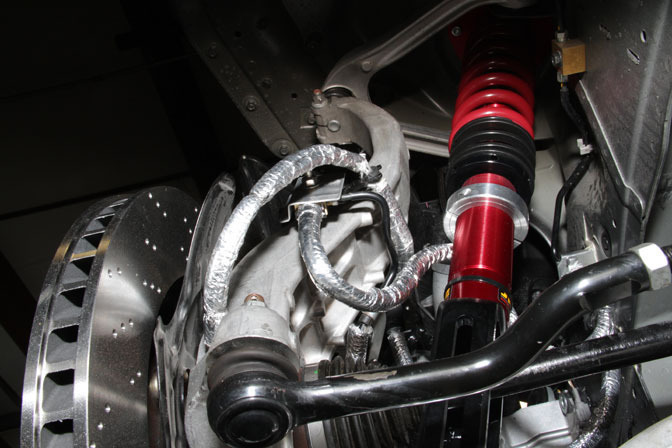 New AMS 90mm Alpha downpipes are added to the project. Only the best JRZ coilovers were sourced for this project. 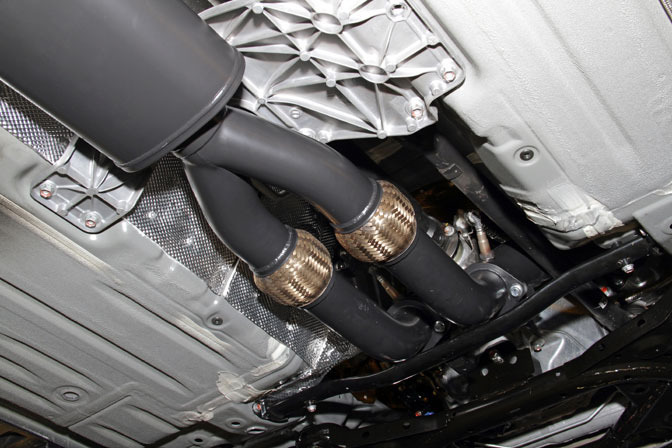 The AMS 90mm Resonated midpipe is added to the exhaust system. 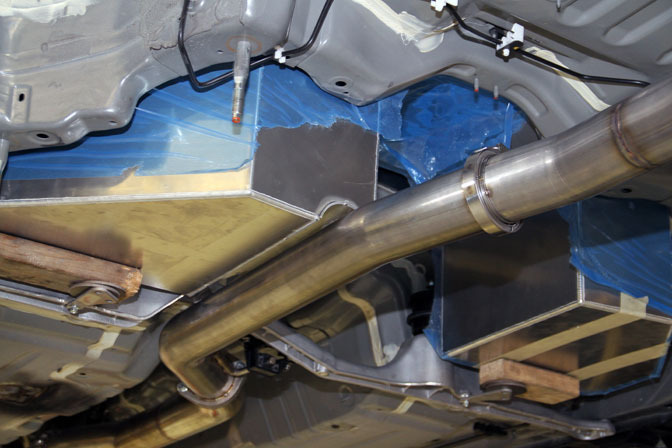 Every exhaust component was also thermal coated again to keep temps down under the car and in the cabin. 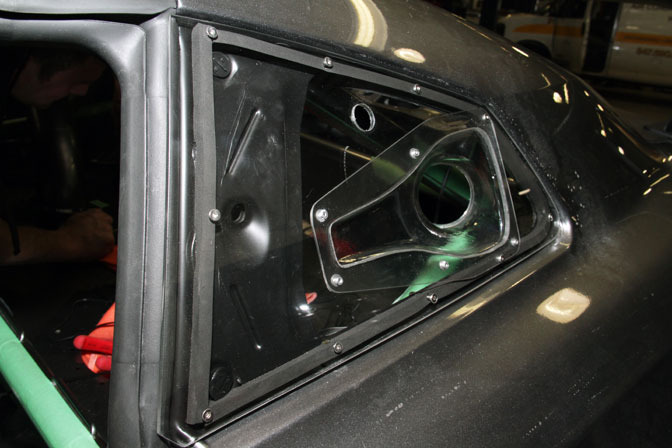 Lexan venturi NACA ducts are installed. These will carry air to the new trans cooler. 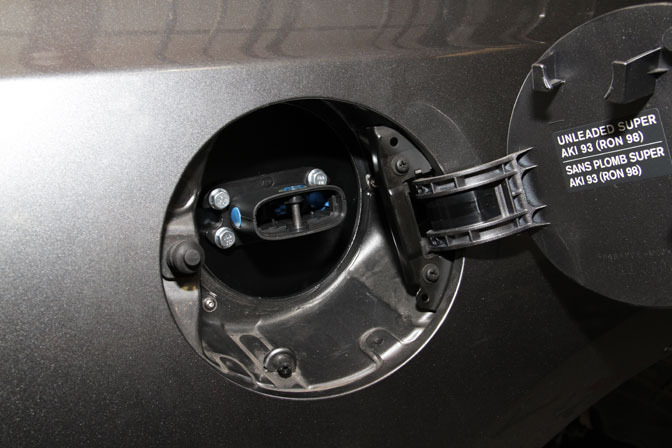 The factory gas door is turned into a quick and efficient battery charging station. 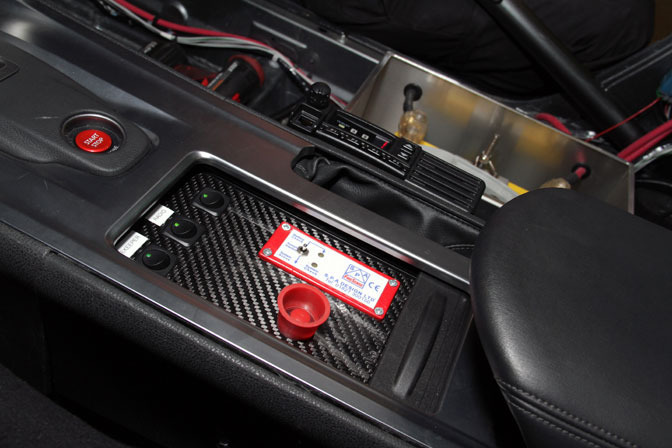 The Motec digital dash and custom mounting plate are installed in the car. World challenge required cameras to be installed in the car. Here Eric Jones installs the roof camera. The new engine is installed and wrapped up. 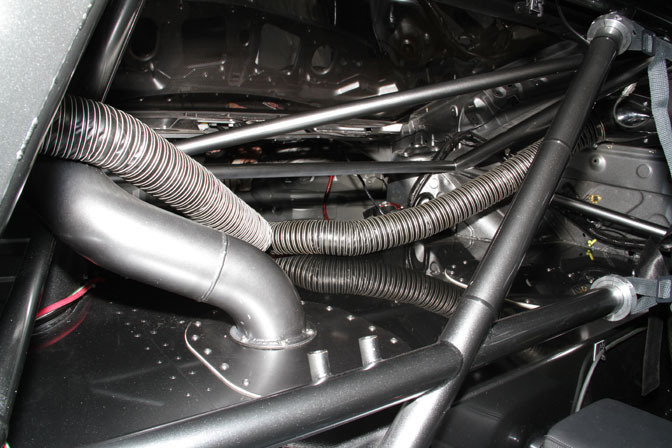 The intercooler pipes are safety wired to prevent a pipe coming off on track. The fuel cell complete with new fill neck. All painted up and looking perfect. Here you can see the two lines from the venturi NACA ducts that feed the trans cooler below the car. Ready for racing! The picture really inspires the need to drive this car!! Shift light, digital dash, battery cutoff, fire supression..buttons and lights galore!!! The extremely accessible and easy to use fire supression system control panel. Juuuuust in case. 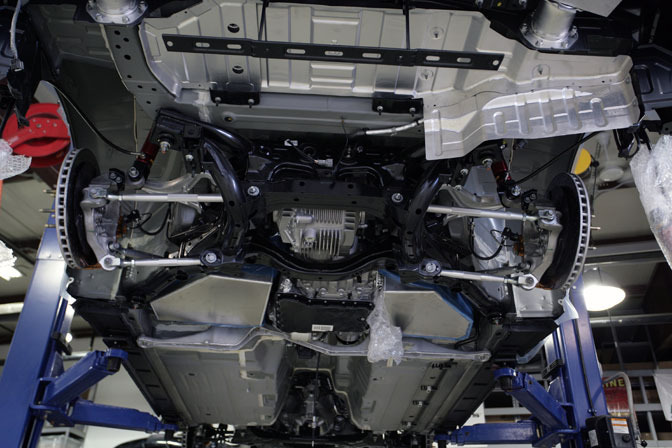 Here you can see the two trans cooler ducts as they enter the chassis and terminate at the trans cooler below the car. 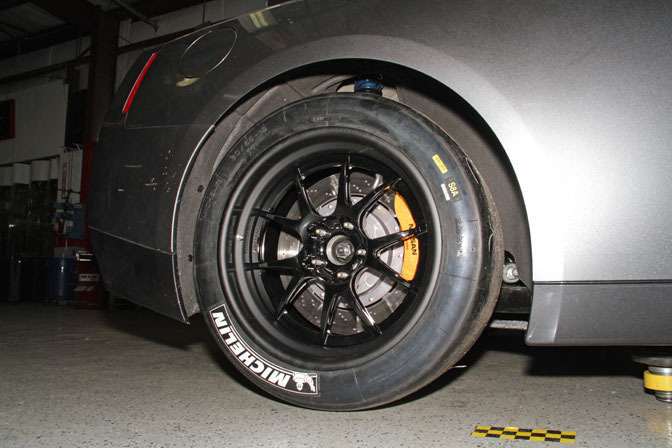 Forgeline wheels installed with test tires ready for some shakedown track testing. 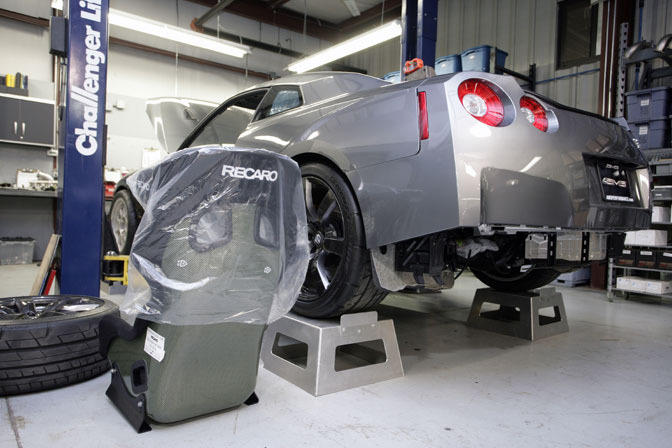 AMS renowned tuner, Chris Black is about to work his magic on the World Challenge GT-R. Here it sits awaiting its first run on our Mustang Dyno. 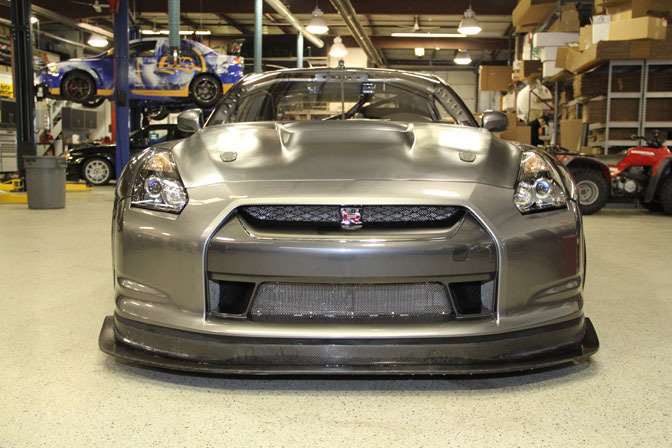 The true form of our AMS-built World Challenge GT-R can now bee seen with the front fascia, carbon fiber splitter and ventilated hood attached. Here we have a shot showing the aggressive yet fully functional wing design. The men behind the build. From left to right AMS president Martin Musial. Chassis and suspension expert Justin Wylde and Head technician on the project Eric Jones. Whats with the wheels tho, theyre hideously small..
Plus all the work done makes the car even heaver..
O_o..... Have a look what size rims F1 cars run. Top quality build guys. What are the two mounts on the passenger side of the harness bar for? What was the race weight do you know? Would be so much fun to drive...so much. WOW unbeliievable, How long did all this take and what was the cost I wonder? Cool pics and detailed description makes for the perfect read...Thank you. 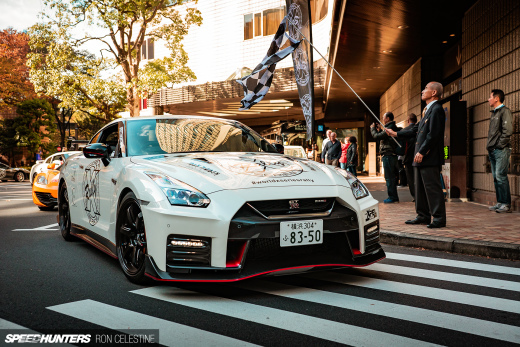 this has to be one of the most informative blogs i've read on Speedhunters, backed up by some quality photo's, which i can imagine wouldn't have been easy to 'take'. Thanks for the awesome article! I love posts like these, there is always much to learn from them. Does the use of a race tire (semi slick) mean you can use fatter sidewall and still be effective? I like meaty tires but am confused where to draw the line. Especially for street tires, how much sidewall is best for performance? I thought a reasonably up-sized rim would help the sidewalls be stiffer and help turn-in? Stunning work, that's great ! Thanks for sharing. @ O_o I'd imagine the reason why these wheels are smaller than say a Porsche or a Volvo running in the same series is that this car probably benefits from having a little more absorption through the tires, perhaps due to the weigh or AWD. Either way, as silly as they may look, I'm gonna say these guys certainly know more about racing and preparing up a proper set-up better than any of us. 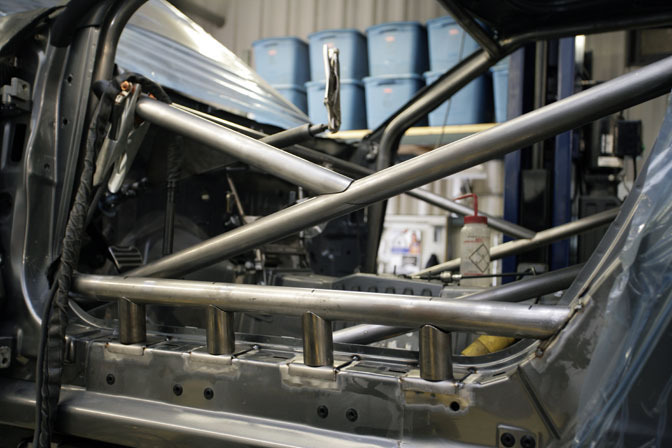 Plus, "all that work" is required if the car is to race in the series. 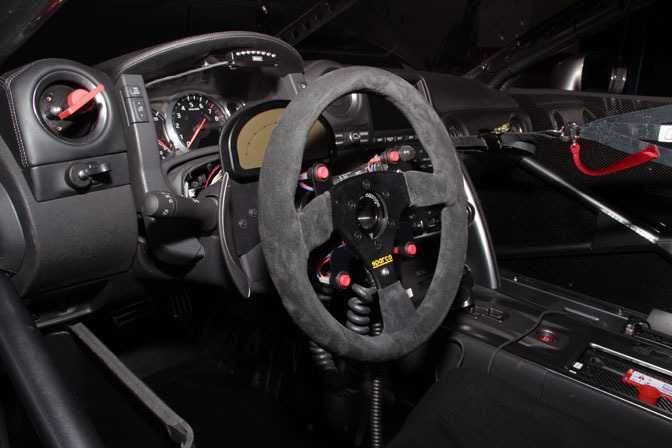 Maybe I'm stupid, but I got one question: what's with the stock gear shifter knob? No upgrades gearbox-wise? for me that was one of the best bulids featured on the site for a long time!! AMS are killin it! cant wait to see this bad boy out on the track! 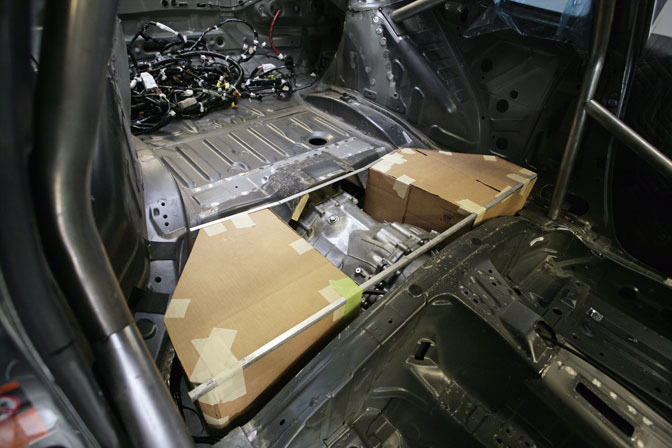 Obviously it makes the car heavier when you add bars of metal in there, but if you have ever even driven a car with a cage it gives a good amount of rigidity to the chassis and it also provides the driver with safety. 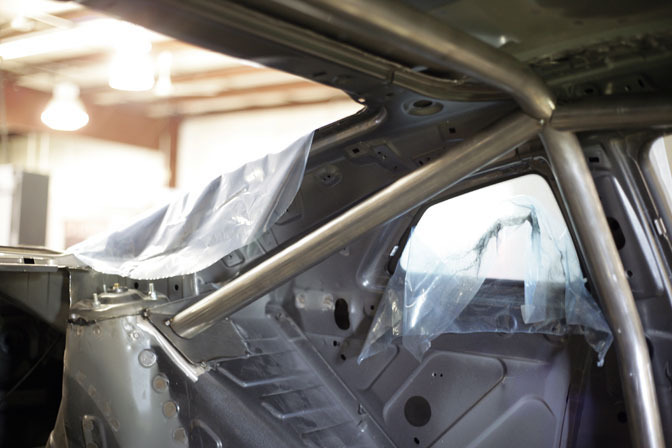 When the car is stripped down it will probably still be lighter than a stock gt-r, but it will have a lot more chassis rigidity and provide much more safety. I didnt know that world challenge requires the exhaust to run out through the back of the car. Otherwise I would have ran it out the side and negated the risk of heatsoaking the fuel cell. Wow, great Build!! Love the fab work!! So with all the weight saving going on, why put the stock dash and interior trim back in? Nice! Want to see this bad boy out there on the track! I wonder how O_o thinks and knows that the work carried out would be heavier than the original?! Great build though. What kind of cars does this series have? And the final weight was?? Not much point weighing it at the start if you dont weigh it at the end! @ O_o: LOL! Would you prefer hella frush yo on a race car? you're an idiot, did you see any of the pictures? 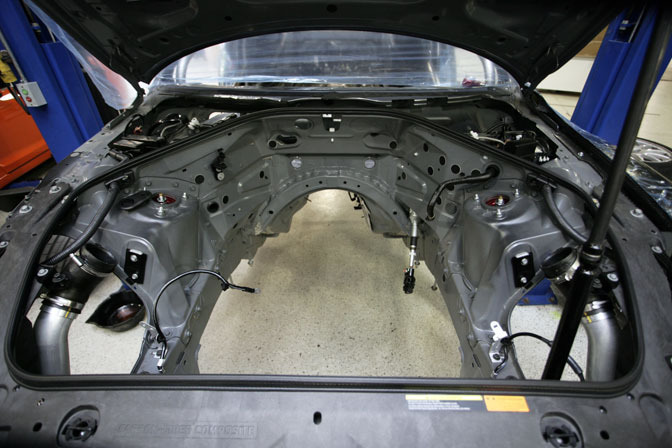 Weight reduction means that weight is taken off or replaced with lighter examples. O_o: You sound like you havn't much of a clue. Alot of good work here! Can't wait to see it on the track. heavier???? welcoming to safety mate. O_o clearly doesn't get it. Nice work, guys! Can't wait to this baby on track! I thought World Challenge runs a spec tire? Those look like Michelin road racing slicks. Well a final weight, and HP figure would be pretty nifty!! 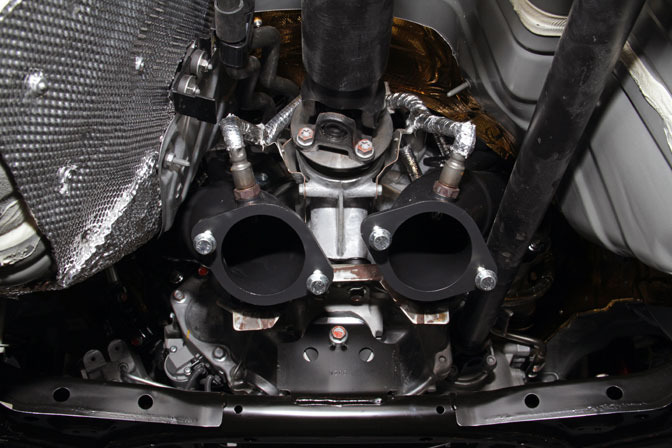 I dont have any experience building race cars, obviously ams know what there doing but that exhaust runs really close to the fuel cell and even with heat wrapping obviously the fuels going to get a little hot, can someone please explain tp me the effect that hot/warm fuel effects the engines performace? yeahhh gr8 work Rysiuuu !!!! Those GA3R's complement the car very well ! How much does the car weigh right now? So... They put it on corner weighting equipment and got some huge numbers out of it. They stripped some stuff and lightened some other. But almost the entire interior around the driver is intact, stuff like the dash, the compartment behind the gear shifter and so on. But that might be because of restrictions in the class? Also, what's the final corner weight? AMS at its best again. 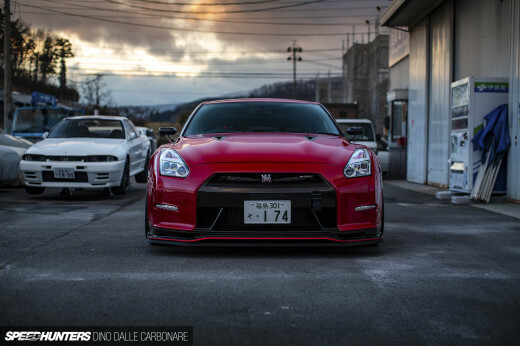 from racecar to street car the def own the GTR game right now. I would love to know the numbers on this thing? Proper Writeup from the best. Well the reason for the small wheel/tire combo is simple,math and fisics why do think go carts are so fast yet is only a 125cc engine, or perhaps a drag racing funny car develops 3000+ hp and carries that masive tire in the back that streches every wich way is all gearing and putting the power to the ground in an effective manner, really simple...right??? excellent post. first post I've read here since skyline-yawn-fest month started. more like this please. Great article, this is really a great build! 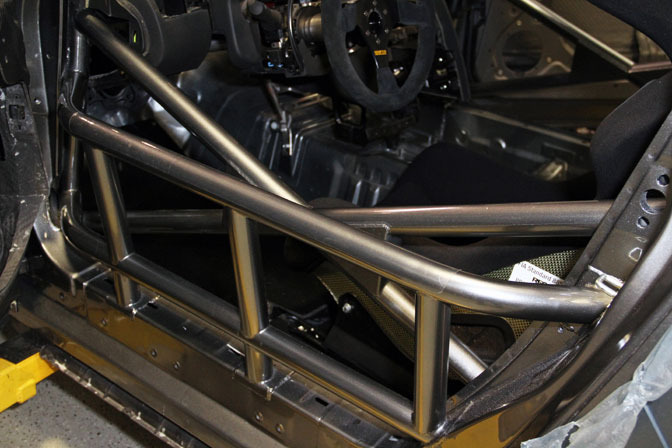 And that roll cage... is just a piece of art! Wonderful! BUT, as someone else asked, what about the gearbox? Are you using the standard flappy paddle one not even with a clutch reinforcement? I mean, it's really good the standard one, but maybe not so good for a racing series? It has something to do with the regulations? 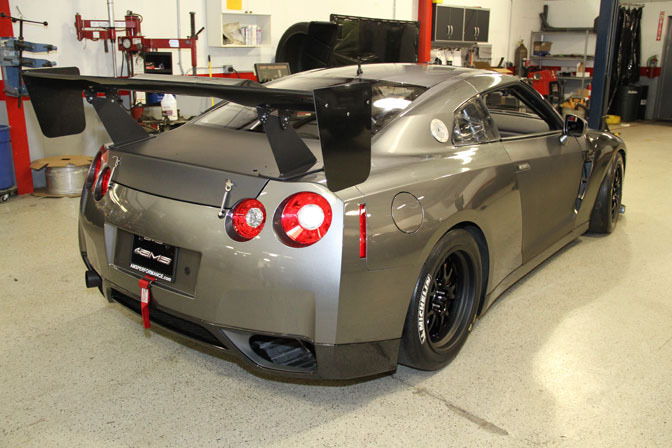 MAN you guys went to tuning EVOs to building some the best all out full blown race GT-Rs.......INCREDIBLE. Keep up the good work guys. The reason with the smaller rim size and thicker side-wall is due to that, race slicks are constructed in a totally different manner with "function over form" in mind, from rubber compounds to reinforcement layering than what your sporty nice looking :run of the mill" low-pros that you get at the local tire shop. First thing is that the rubber that is in contact with the road is thicker in depth and reinforced with either kevlar/C.f or both at times to control tire heat and deflection for long periods of extreme load and distance. second the thickness of the side wall has to do with again the thicker rubber depth and heat control, also the side-wall is reinforced with kevlar/C.f for deflection control and to prevent the tire from pulling away from the rim itself under these extreme conditions. Finally these are purpose built for one thing and one thing only (racing), instead of the road legal sport tires. Sure they work a lot better than the "plan jane" all-seasons for the department store but, they are constructed for the odd highway/ track-day zip here and there but are manly constructed with the bottom dollar in mind to the manufacture and an eye catching "form" so you grab their tire off the shelf instead of their competitors. other than that race slicks are in a totally different league than good looking rubber bands. is this car for brass monkey racing? Thank you for all the nice comments everyone! The answer to most of your questions are simply "World challenge requires it" That's the reason for the wheel sizing, dash still being in the car, Exhaust running out back etc etc. World challenge GT adheres to a strict set of rules and we have to abide by them. In response to the exhaust being too close to the cell keep in mind that was not a finished pic. 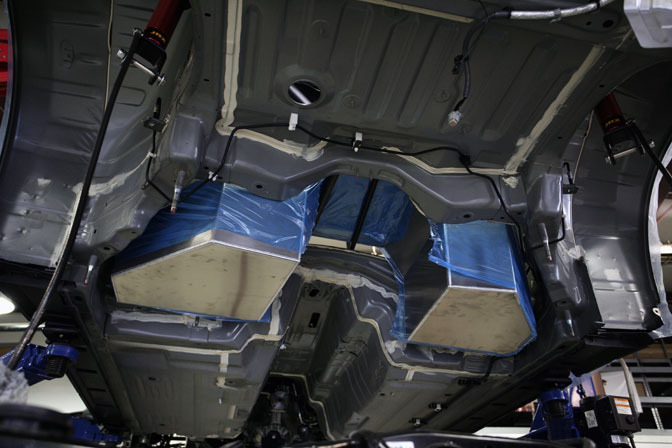 The final product involved thermal coating on the exhaust and a heat shield on the fuel cell. It is also not nearly as tight as it might look in the pictures. Final weight and HP numbers are being kept private at the request of the owner of the vehicle. A fantastic build yet again, keep up the good work guys! Top notch indeed. Funny how local "shops" try to do the same thing and do not even shed the smallest amount of light on this. Good job guys. I'be interested to see what upgrades you guys made to the gearbox as well as the differentials. Stock brakes? Thank you for the response to my question! So semi slicks and slicks do in fact have a significantly different construction, and not just compound. Interesting! So...the reality of it is that unless using slicks, tall sidewalls don't really give a performance benefit, do they? I mean, aside from softer ride, cheaper to replace, and less rotational mass..they don't help handling as much as upsizing rim diameter (within reason) and reducing sidewall size? Anyone feel free to chime in? Though I wish speedhunters had a more robust commenting system with log in's, tracking responses, etc..